OpenCloth is a collection of cloth simulation algorithms. Each algorithm is available with its own and independent Visual C++ project. Cloth rendering is done with the OpenGL API. The projects require only few libs: GLEW, Freeglut and GLM. Most of the simulations are done with the CPU except the Verlet based one that is available in two flavors: CPU and GPU (the simulation is processed by a GLSL pixel shader). Introducing an OpenGL based cloth simulation code base. We implement all of the existing cloth simulation algorithms in as simplistic an approach as possible so that learners may know exactly what is needed to get a cloth simulation system up and running in OpenGL with a minimum of fuss. OpenCloth project has been initiated with a view that it may help beginners and researchers alike to implement the basic algothims for cloth simulation using OpenGL API. It is not intended as another library that you can plugin into your game engine directly. Rather, you can learn from it and then implement a technique or two in you own game/physics engine. With a little bit of effort, it should be straight forward to implement the discussed algorithms on other platforms and Graphics API. Focus is on how to handle the bare minimum required to implement the techniques. Rather than wrapping code into classes, we implement the whole code in a single source file. OpenCloth is not competing against NVIDIA PhysX. It is a collecion of source codes showing u how to do cloth simulation from scratch so beginners and coders know exactly what is going on inside the physics engine. It was never intended to be a high performance competitor of PhysX rather it shows what PhysX does not even detail i.e. the internals of the physics engine. Another important distinction is that PhysX is closed source while Opencloth is opensource. 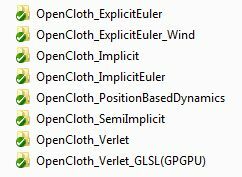 OpenCloth was never intended to be a competitor of NVIDIA PhysX. Infact it is just a collection of cloth simulation codes that shows u what goes inside a Physics engine; something that you cannot see in the PhysX library since it is closed source.